Today is April 18, the first day of the Novena of the patron saint, Our Lady of the Village. The adoption of the name Corella was made at the behest of Fray Jose Maria Cañabas, then the parish priest of Baclayon and endorsed by Fray Felix Gullen, the first Spanish priest. Corella was a name of a village in Navarra, Spain where this town’ patroness, Nuestra Señora del Villar showered miracles. Who is Nuestra Senora del Villar? If we search Wikipedia, List of Roman Catholic Saint, we can not find such name . Blessed Virgin Mary who made apparitions in different places and canonized and titled as saints such as: Our Lady of Miraculous Medal, Our Lady of Fatima, Our Lady of Mt. Carmel, and Our Lady of Pillar. And some other apparitions are not canonized by the Catholic Church like Our Lady of Medjugorge.There is no such miraculous Blessed Virgin Mary's apparition in Navarra, Spain. If we look at the list of patron saints of all the churches in Bohol, we could not find any except in Corella. How miraculous and saintfull is Our Lady of the Village is questionable! Ako nagpadala ug personal letter sa usa ka pare nga kauban namo sa TB with his username chicigon. 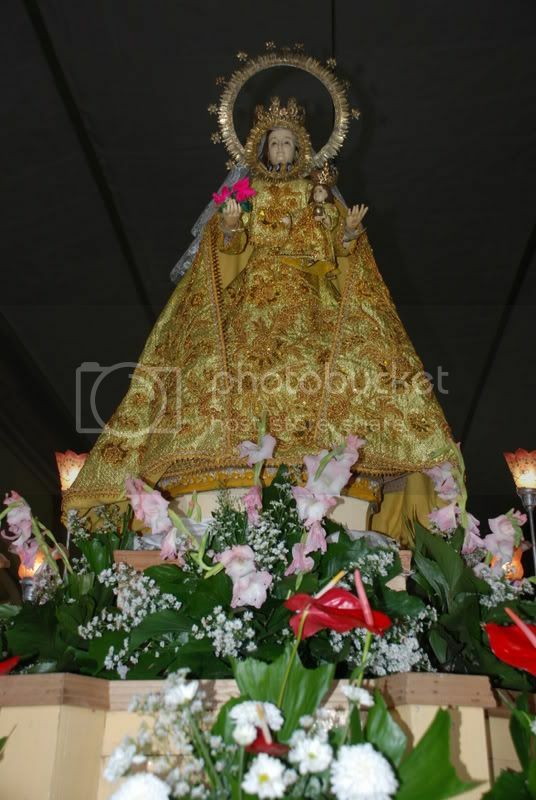 Nangutana ko bahin sa patron saint sa atong lungsod, Our Lady of the Village bahin sa iyang pagkasantos. Pinaagi sa TB gusto ko maka shared sa iyang pagka blessedness ug ang iyang saintfull life sa mga tawo pinaagi sa pagpost sa iyang kaagi . Apan subo palandungon sa wala makita sa listahan sa mga santos . Komusta..,. I would like to know the blessedness and saintfull life of our patron saint of our town, corella Bohol, Our Lady of the Village. I had many research made and I can't find the name in the List of Saints in Wikipedia. I do believe it is appropriate for you to answer being a priest. Please post you answer in the posts of Corella for further clarification .The parochial fiesta is on April 27. Some believes that Our Lady of the Village is a questionable saint. No other places throughout the country is celebrating that saint. This inquiry is to strengthen of faith to God. Sir FD human najod kog laag tibuok virtual reality wa man jod bisag usa nga explain aning maong patron sa "Our Lady of the Village." Basin sa Pilipinas or UNIQUELY locaL ra ni nga "devotion" or movement sama sa Birhen Sang Barangay. Sorry kaayo di ko makatabang nimo kabahin ani. kini nga pangutana usa ka hagit, apan ang grasya ug gahom sa Kahitas-an dili matokob sa atong gamay nga pangisip, busa kita magpabilin mga matinud-anon Kaniya ug sa Mahal nga Birhen. Kami si hofelina, the master researcher of saints , Father chicogon ug ako, mga TB members nag research gihapon bahin sa atong patron saint, Our Lady of the Village. Hangtud karon wala pa namo makita ang iyang ngalan sa Master List of all Catholic Saints bisan ug links na lang or local stories from other source. Sa mga viewers, kon duna moy nahibal-an sa story of Nuestra Senora del Villar, palihog epost ninyo. Welcome Padre! thanks for your posting which I presume is the best answer. Welcome Robert sa imong pag-apil diri sa TB. Nakita nako ang imong website sa Corella.Ikaw pa ang unang nakabuhat ug website sa atong lungsod. "Continue the good works,"
Komusta diha hapit na ang pista. Daghan nang mga vacationers nga nangabut diha. Kaila ko sa imong Papa ug Mama, pero ang familliar nako kaayo from head to foot ang imong Lolo, si Manong Untong. Lumad nga taga Canangcaan ko, my permanent residence is Digos City. it was a sort of accident, nga nakakaplag ko ni-ining site.its nice to know people around,especially from our townfolks. my dad is roberto (bebing) we used to visit tata ontong and nana pastora when we're kids. nagtanom sad mig kahoy diha sa canang-caan duol ila nong eden daray. i'm based abroad na for many years. its nice to hear from you. Robert.., anak man ko ni Eden Daray. Basaha ang akong mga posts sa Corella kay daghan kong gisulat diha. Malipay man ko ug naay mosumpay sa akong post labi na gyud ug taga Corella. Accidental pod nga naopen nako ang imong website sa Corella. Nindot kaayo kay nakita pa nako sa gallery of pictures ang akong classmates ug teachers sa Corella Central Elem School in 1960. Presently, I am residing in Digos City since 1970. Happy pista...., sa ato karong Abril 27. 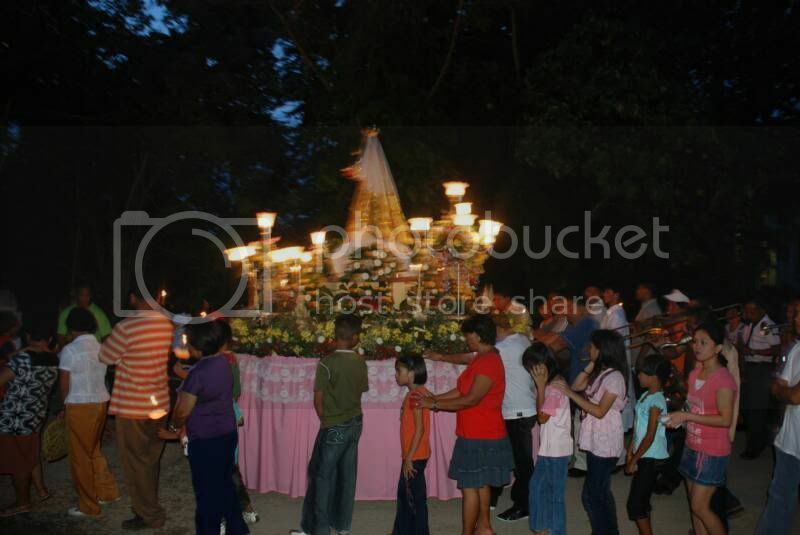 Today, April 27,is the parochial fiesta of Corella, Bohol in honor the the patron saint Our Lady of the Village. The last day of the nine-day novena highlights the procession of the saint around the town plaza, along the municipal hall. Corellahanons are widely known for being deeply religious and devotedly Roman Catholic. Long before, this religious activity, the procession marked with notable success and is attended by devotees from far-flung barangays who trek on foot to the church just to fulfill such obligation. 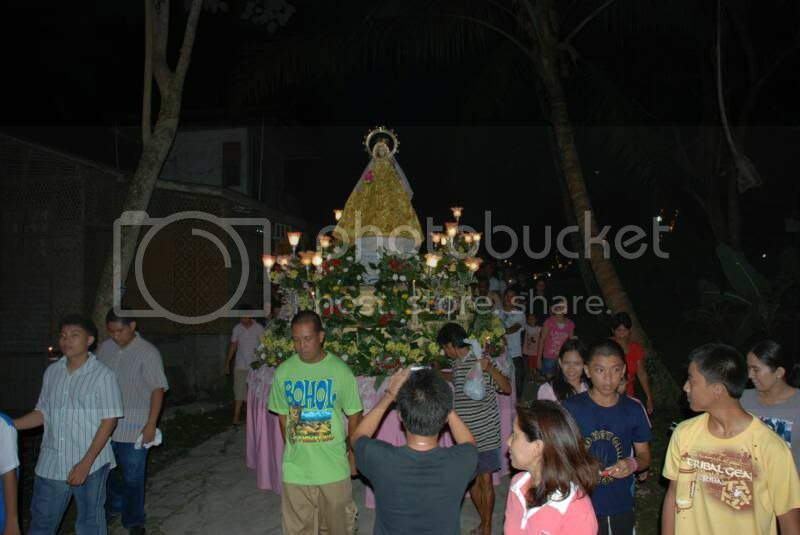 Those who live outside Bohol fell wholehearted desire to go home every fiesta time to venerate the patron saint Nuestra Senora Virgen del Villar. May 15, 2010, Happy fiesta diha sa New Corella Davao. Mamista na pud diha ang mga taga Corella Bohol. us closer to the earth and all its grains, crops and fruits. every house was festooned with varieties of food and delicious recipes. saw this, so San Isidro was not fired from his job. comes, especially during these times. Thanks for the additional information, Mr. Daray. Sa mga Corellans, advance happy fiesta. One month from now, is the town fiesta of Corella, April 27 of the Lady of the Village. 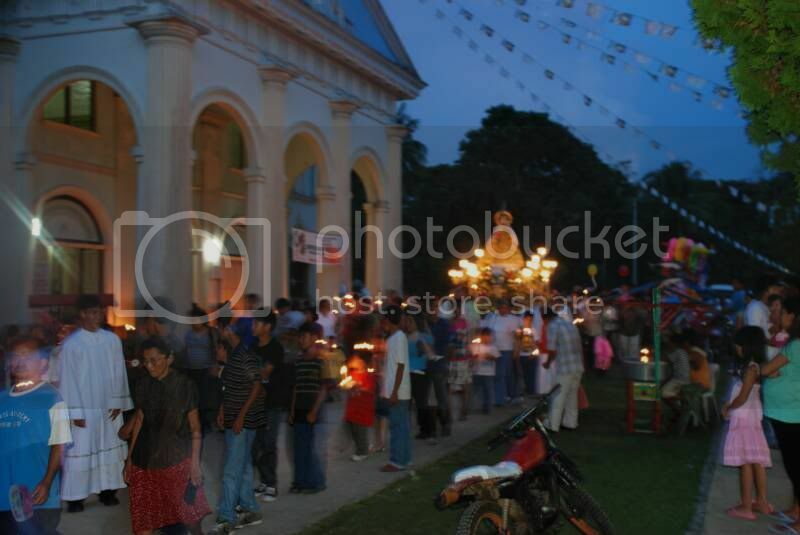 Mabuhay and happy fiesta to the peace loving people of Corella, April 27, 2011.
Who's Who of Corella, Bohol?